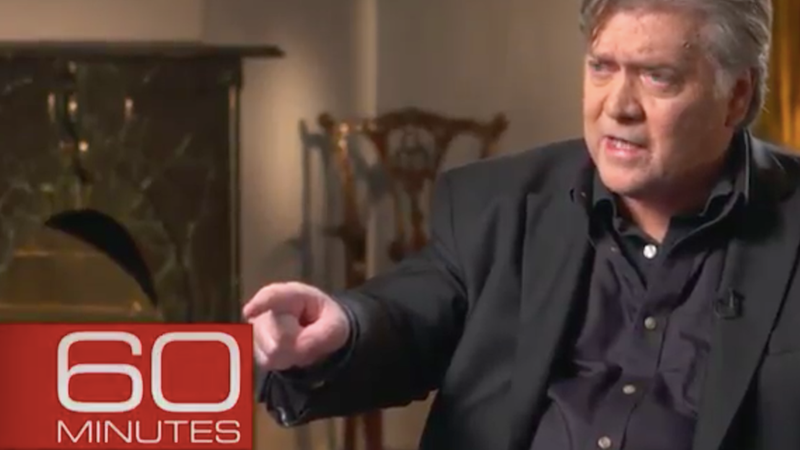 Former White House chief strategist Steve Bannon appears on 60 Minutes Sunday night in his first-ever TV interview. Top quote: "The Republican establishment is trying to nullify the 2016 election. That's a brutal fact we have to face." On 'the establishment': "In the 48 hours after we won, there's a fundamental decision that was made. You might call it the original sin of the administration. We embraced the establishment. I mean, we totally embraced the establishment ... Because ya had to staff a government." On his relationship with the president: "I think I'm a street fighter. And by the way, I think that's why Donald Trump and I get along so well. Donald Trump's a fighter. Great counter puncher. Great counter puncher. He's a fighter. I'm going to be his wing man outside for the entire time, to protect [Trump]" and "to make sure his enemies know that there's no free shot on goal." On Trump's Charlottesville remarks: "I was the only guy that came out and tried to defend him." On Gary Cohn's critical interview with the Financial Times: "If you don't like what [Trump's] doing and you don't agree with it, you have an obligation to resign." On Republican criticism of Trump's national security strategy: "That's the geniuses of the Bush administration. I hold these people in contempt, total and complete contempt ... They're idiots, and they've gotten us in this situation, and they question a good man like Donald Trump," Bannon said, naming Condoleezza Rice, Brent Scowcroft and Colin Powell. On the Russia investigation: "It's a total and complete farce. Russian collusion is a farce." On Trump's tweets: "He knows he's speaking directly to the people who put him in office when he uses Twitter ... [General Kelly's] not going to be able to control it either because it's Donald Trump." On campaign discussions following the Access Hollywood tape's release: "Trump went around the room and asked people the percentages he thought of still winning and what the recommendation. And Reince started off and Reince said, 'You have two choices. You either drop out right now, or you lose by the biggest landslide in American political history.' ... And I told him as he went around, I was the last guy to speak, and I said, 'It's 100%. You have 100% probability of winning.'" On the Catholic Church's support of DACA: "Because unable to really to come to grips with the problems in the church, they need illegal aliens, they need illegal aliens to fill the churches."